“Alzheimer’s disease is a devastating disorder for which there are no satisfactory treatments. Our findings reveal that gamma-secretase activating protein is a potential target for a new class of anti-amyloid therapies,” says Dr. Greengard. The Fisher Center for Alzheimer’s Research Center at The Rockefeller University, is a world renowned research team all working under the direction of Nobel laureate Dr. Paul Greengard. Our scientists are at the forefront of research and, based on their understanding of how the disease ravages the brain, have developed many insights into how the devastating symptoms of Alzheimer’s disease might be prevented or delayed. Dr. Greengard has authored more than 1,000 major scientific papers. We have selected recent samples of scientific studies from major publications such as Nature, Science and the Proceedings of the National Academy of Sciences (PNAS). Our lab publishes a multitude of findings per year in our quest to find the cure for Alzheimer’s disease. Listed below you will find a synopsis of each of the studies provided. Click on the subject heading (for example “gSAP” below) to see the full press release and PDF of the actual finding. Published in the Proceedings of the National Academy of Sciences on April 25, 2011, Fisher scientists found that use of anti-inflammatory drugs such as ibuprofen, aspirin and naproxen, reduces the effectiveness of selective serotonin reuptake inhibitors (SSRIs), the most widely used class of antidepressant medications. 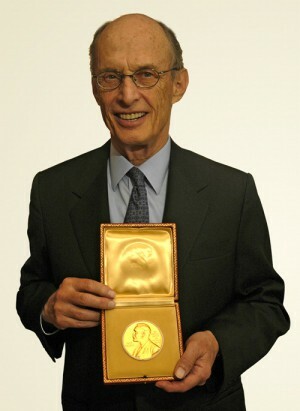 The discovery from scientists in Nobel Prize-winner Paul Greengard’s laboratory may explain why so many depressed patients taking SSRIs do not respond to antidepressant treatment and suggests that this lack of effectiveness may be preventable. In the March 7, 2011 issue of the Journal of Federation of American Societies for Experimental Biology (FASEB), Dr. Greengard and his team of scientists succeeded in accelerating the breakdown of beta-amyloid. They discovered that a process called autophagy reduces the buildup of beta-amyloid in isolated cells and might be utilized to eliminate the buildup of beta-amyloid in the brains of Alzheimer’s patients. Autophagy is a process cells use to “clean out” the debris from their interiors, including unwanted materials such as the protein aggregates that are hallmarks of Alzheimer’s disease. The scientists discovered that a compound called SMER28 lowers the level of beta-amyloid found in nerve cells. This occurs because SMER28 stimulates autophagy, which then rids the cell of beta-amyloid. The protein, called gamma secretase activating protein (gSAP), is expected to become a major target for anti-amyloid drugs that inhibit the brain’s ability to produce toxic beta-amyloid in Alzheimer’s disease. Fisher scientists also discovered that gSAP is a target of the anti-cancer drug, Gleevec, which they previously showed could lower beta-amyloid levels in the brain. The new study showed that Gleevec lowers beta-amyloid production by binding to gSAP and preventing it from activating an enzyme called gamma secretase, which is responsible for producing beta-amyloid. The findings are reported in the journal Nature. Understanding how the brain works is complicated by the fact that there are so many different kinds of brain cells, doing different things, which are crowded into the same regions of the brain. Previously, the only way to approach this was to look at individual cells, but that is a Herculean task. So, the scientists at our lab recently developed a new tool called TRAP (translating ribosome affinity purification) that allows them to see the nature of many cells at once, even when they lie in regions of the brain that contain a veritable jungle of different cell types. Using TRAP, they are now able to analyze the subtle differences between cells that they couldn’t detect before to see which cells are more resistant to beta-amyloid plaque, and learn what is responsible for this resistance. Article on TRAP in Preserving Your Memory magazine. There is no single known cause for depression. Depression is believed to result from a combination of genetic, biochemical, environment and psychological factors. Each year over 17 million American adults experienced a period of clinical depression. In Alzheimer’s patients, depression is a major problem that often results in agitation. Depression experts claim that many people with a depressive illness never seek treatment. Some have suggested that if antidepressants started working in hours or days rather than weeks or months—more people would seek treatment. Article on P11 in Preserving Your Memory magazine. The neurofibrillary tangles characteristic of Alzheimer’s disease are composed of the protein called “tau.” In this study, Fisher scientists found a new way to inhibit production of neurofibrillary tangles. The quantity of tangles in the Alzheimer’s brain is closely correlated with the degree of cognitive decline, suggesting that tangles or the changes known to occur in the tau protein that precede tangles may contribute to cognitive loss in Alzheimer’s. Casein Kinase 1 is a therapeutic target which may be the key to halting the course of Alzheimer’s disease. The findings show that chemicals that block casein kinase 1 do not interfere with an essential pathway that is often blocked by other experimental anti-amyloid compounds. Article on CK1 in Preserving Your Memory magazine. WAVE 1 is a protein and a key regulator of connections between brain cells. It controls the formation of new cell connections which influence thinking and behavior. This knowledge will one day allow doctors to administer drugs that may either prevent the loss of brain cell connections in Alzheimer’s or stimulate the growth of new connections to restore memory and lost function. As published in the scientific journal Proceedings of the National Academy of Sciences, scientists demonstrated through a complex set of imaging technologies and experiments, that an early trafficking protein pathway (COPI) affects APP, a protein that causes the development of Alzheimer’s. This discovery affirms the physiological relevance of this pathway in the progression of Alzheimer’s. By manipulating this pathway, they discovered that the moderation of COPI leads to a significant decrease in amyloid plaques, which contributes to memory loss and other symptoms from which patients with Alzheimer’s often suffer. The reduction of COPI resulted in some improvement of memory impairment. Fisher Center scientists created technology that allows the visualization of amyloid plaques as well as other Alzheimer’s hallmarks, such as tau, vasculature and microglia activation, in a large volume, in an entire mouse brain with the potential application of frozen human brain samples. Using the iDISCO visualization method involving targeted molecular labeling, tissue clearing and light-sheet microscopy, the Fisher Center scientists gained unprecedented access to intact Alzheimer’s disease mouse brains and studied in detail amyloid plaque content in five major brain regions, at different ages. The scientists are now also able to co-visualize in 3D simultaneously amyloid plaques together with two other parameters (e.g. tau, microglia and vasculature). Volume imaging coupled with automated detection and mapping enables precise and fast quantification of plaques within the entire intact mouse brain, a much faster and more economical alternative to standard beta amyloid plaque labeling. This study was published in Cell Reports. Preserving Your Memory magazine provides captivating, enlightening and entertaining articles about healthy aging vs. unhealthy aging.